Hey there! I have been basically “off the grid” for most of this week. We left Bozeman Sunday morning, after Jason successfully defended his Master’s thesis on Saturday afternoon. We have spent the week in Glacier National Park and internet access has been sparse at best, and usually non-existent. Of course, this would be the week that something important came up with my daughter’s preschool, of which I am president of the board. Thankfully, a wonderful and highly competent parent is taking care of that for me! I am presently in a cabin at a KOA campground in Billings, Montana. Tomorrow we have an entirely too long drive to Rocky Mountain National Park, where I will again be completely digitally detached for another couple days. 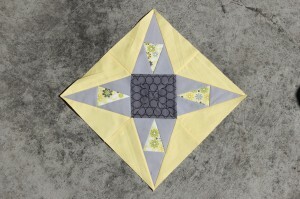 Before that happens, though, let’s make quilt block for Iowa! I found this block at Block Central. 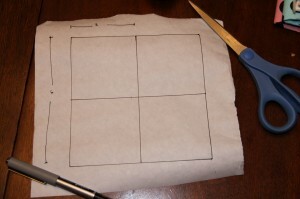 That site has a template, for the block, but it is for an 8-inch block. 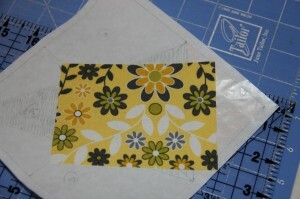 Since we are making 12-inch blocks, I will show you how to draw the template yourself (it’s really pretty easy!). 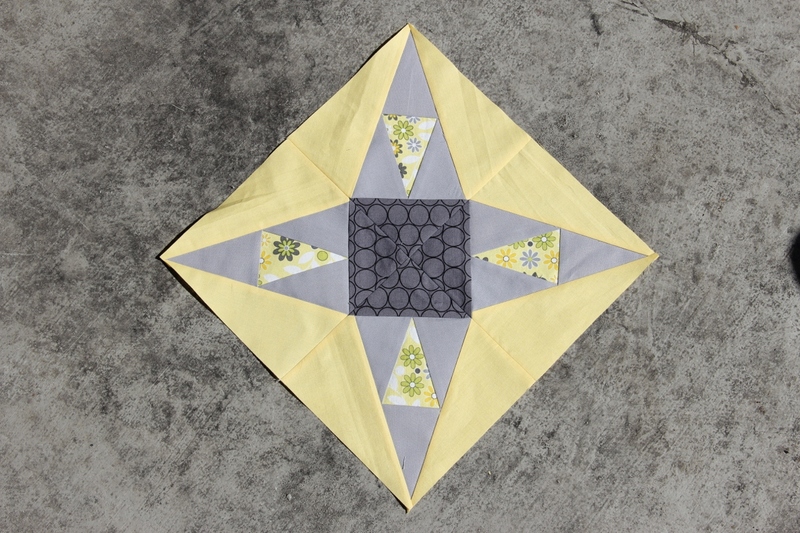 There is a very similar Iowa star at Quilter’s Cache, with a smaller center square and thinner star points, but this one seemed like it would make for an easier template. 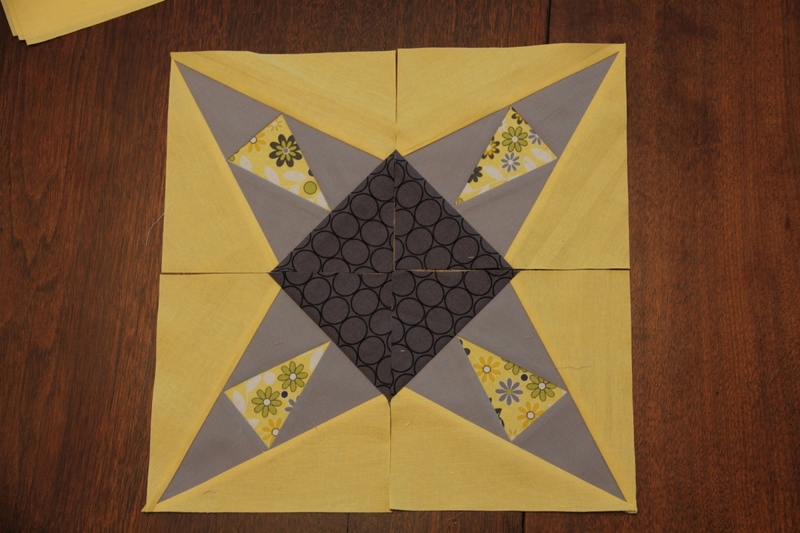 We will make a template for 1/4 of the star block, and paper piece four of them to sew together. 1. 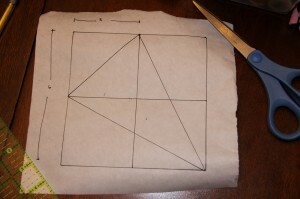 Begin by drawing a 6-inch square on the “paper-y” side (as opposed to the waxy side) of some freezer paper. 2. 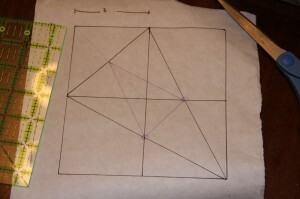 Draw a center grid through the 6-inch square, from the center point of one side, to the center point of the opposite side, dividing it into 4 equal portions. 3. 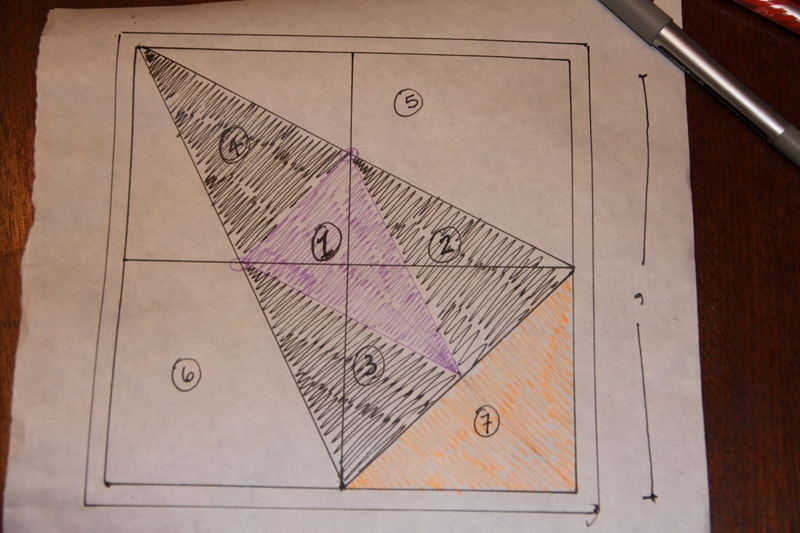 Draw a diagonal line across the upper left portion (from the center of one side of your larger 6-inch square to the center of the adjacent side). 4. 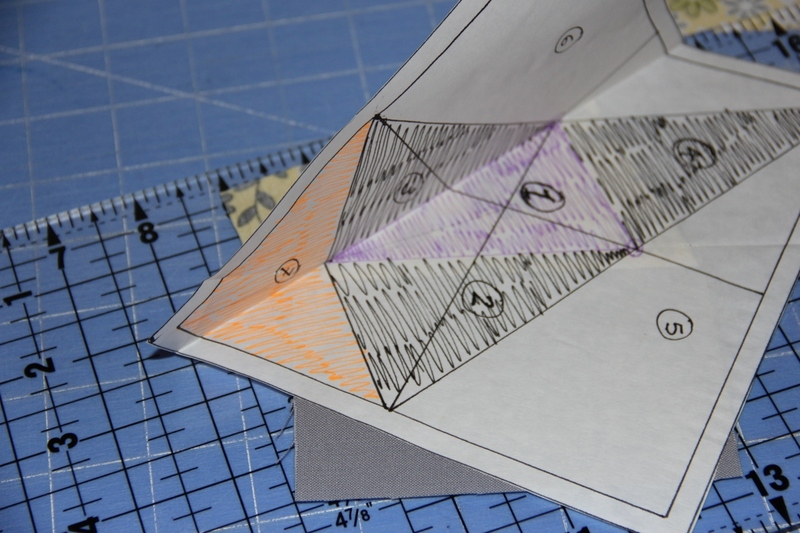 Create an isosoles triangle (two sides are equal) by extending lines from each edge of that diagonal line you just drew all the way to the point at the opposite corner of the 6-inch square (clear as mud? A picture is worth a thousand words here). 5. The sides of that isosoles triangle you just drew cross the inner grid at one point. Connect those points from each side of the isosoles triangles with a diagonal line. 7. That’s it! You just made your template. 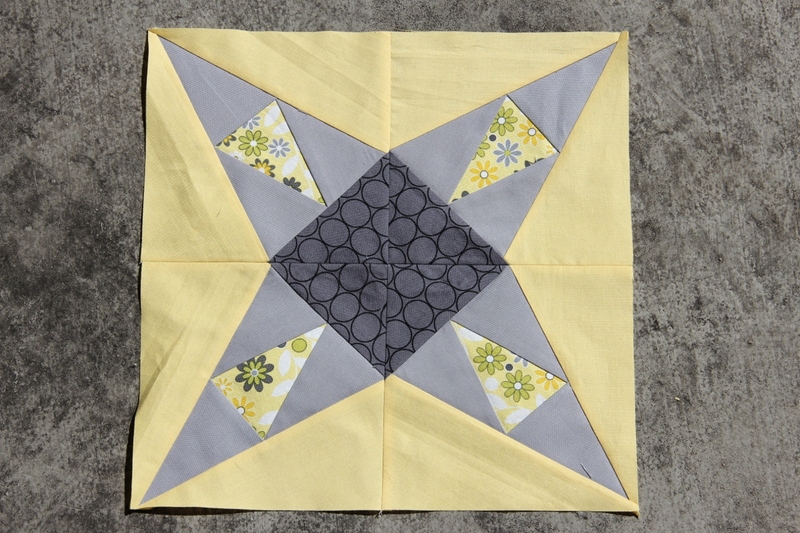 Add a 1/4 inch seam allowance all the way around the 6-inch square and fill in your “quilt by number” number for the paper piecing. 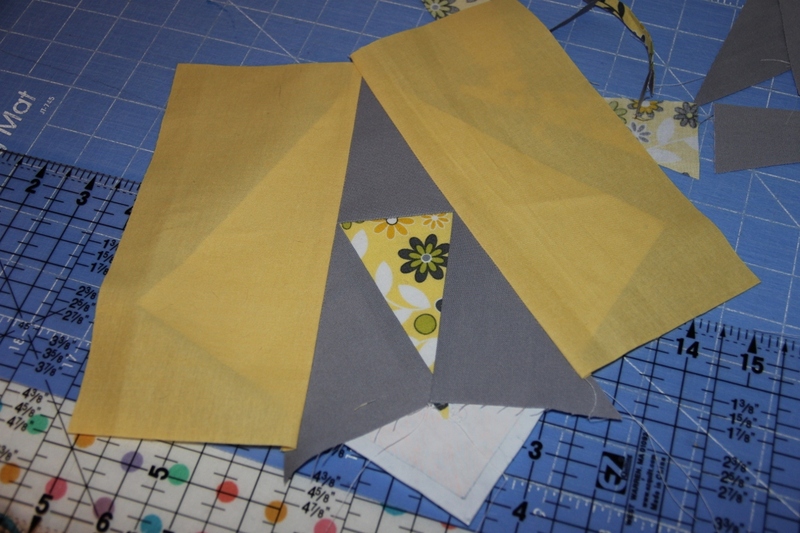 Number one is the small, center isosles triangle. 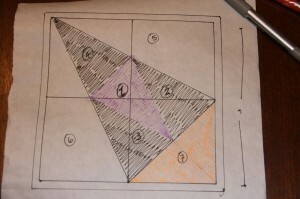 Numbers 2 and 3 are the triangles to either side of that center one. 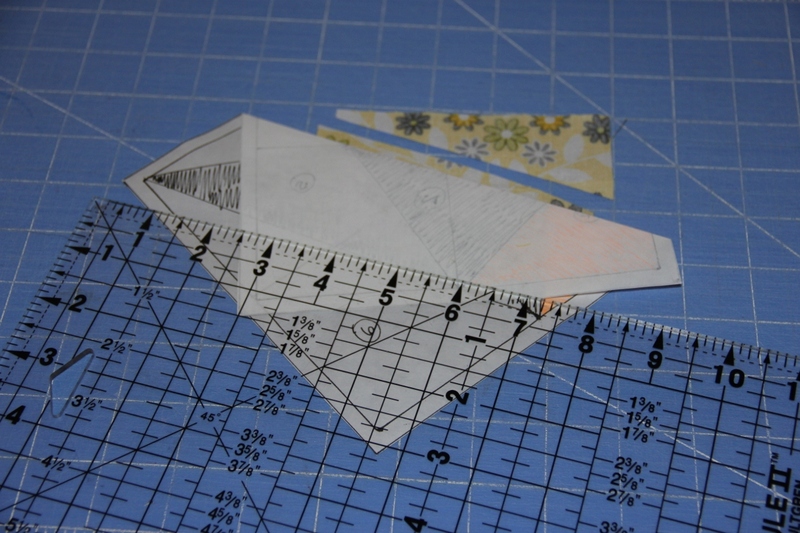 The tip of the large isosoles triangle is Number 4. The background pieces to the sides of the large isosoles triangle are Numbers 5 and 6. 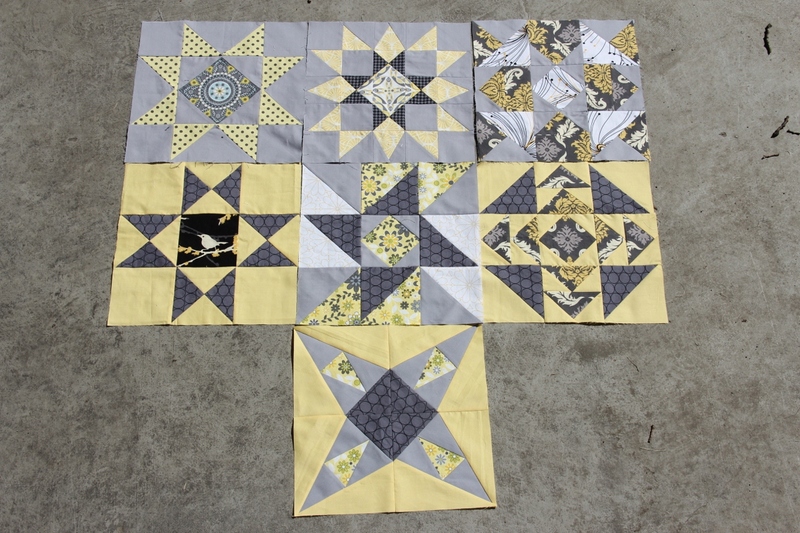 The pieces that will be the center square of the finished block is Number 7. 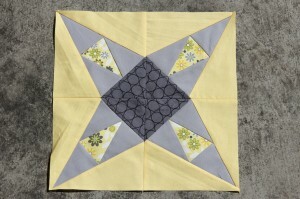 Place the fabric for the center of the star point right side up on the waxy side of the freezer paper. 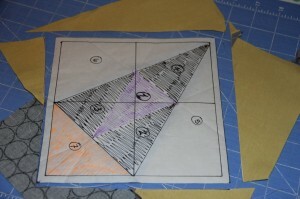 Be sure that the fabric covers the portion of the template that represents the center triangle of the star point. Flip the paper over. 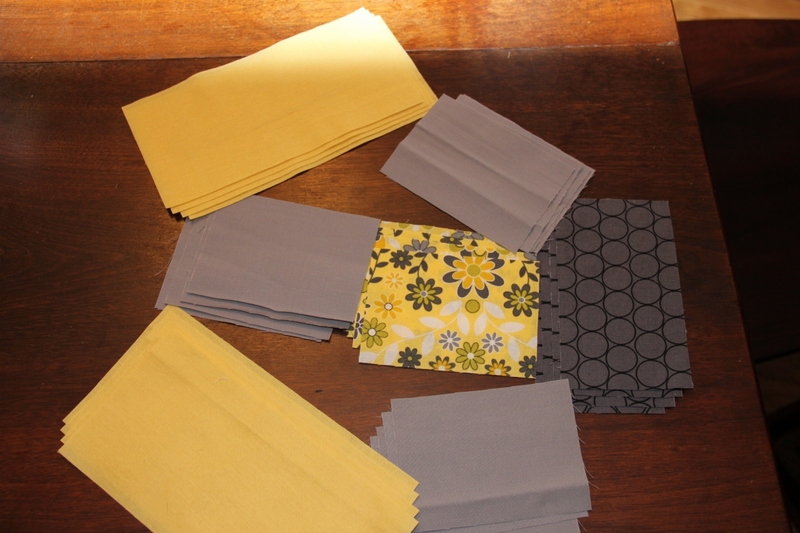 Apply a hot iron to stick the fabric to the freezer paper. Fold back the paper along the line between Number 1 and Number 2 so that the drawn line is just barely showing on the upper side of the fold. 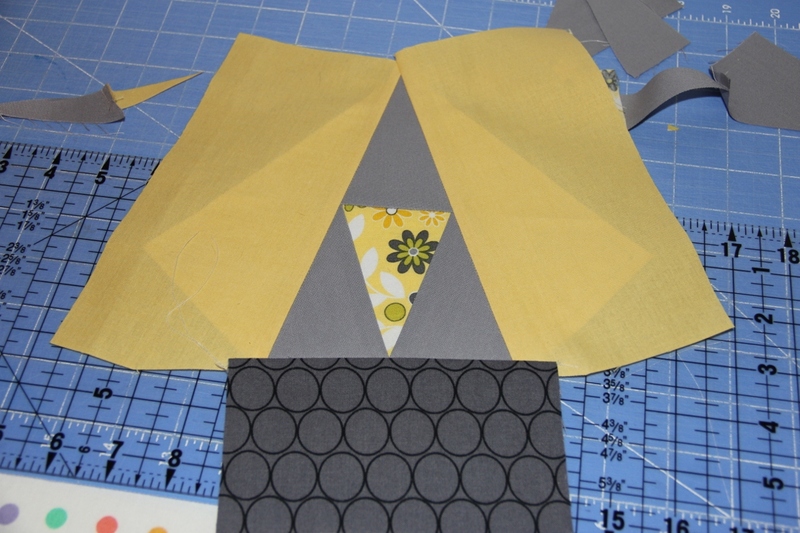 Line up the fabric for Number 2 with the edge you just trimmed. Sew the two pieces together, allowing your needled to be as close to the fold as possible without piercing the paper. Unfold the paper and iron the fabric open with the tip of your iron. Flip the paper over, iron the paper over Number 2. 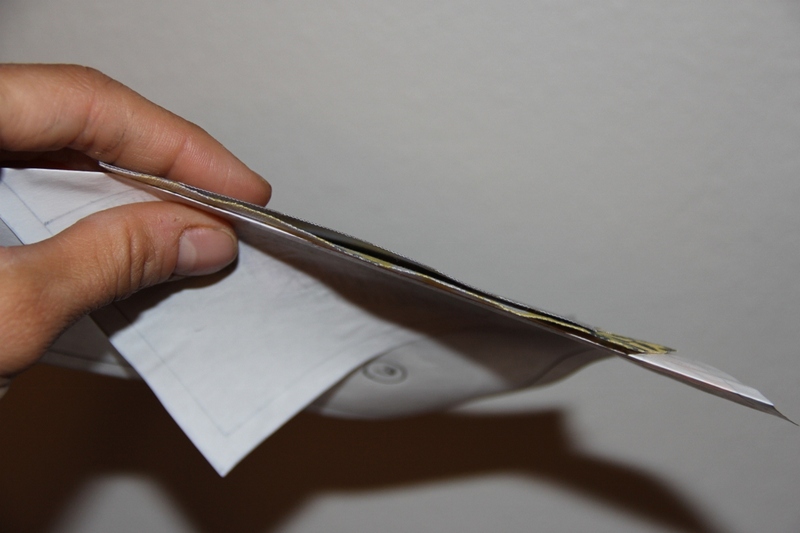 Fold back the paper along the line between Number 1 and Number 3. Repeat as you did for the first piece. Trim the fabric to 1/4 inch beyond the fold. 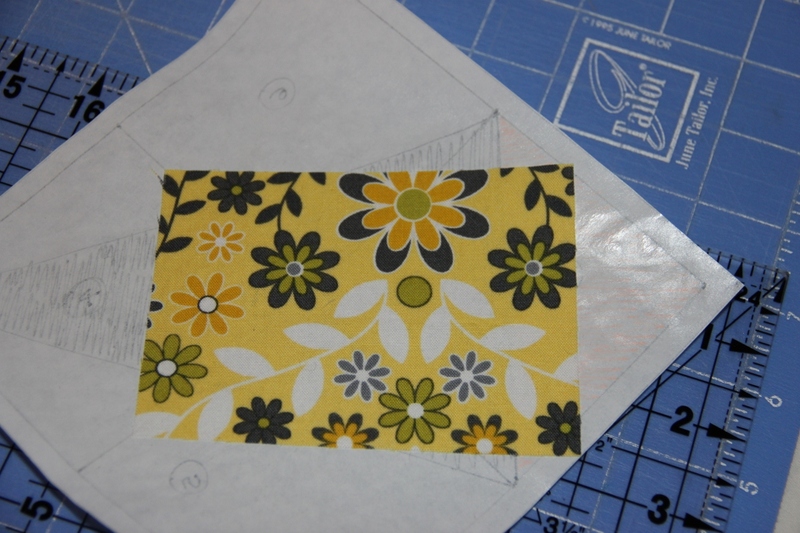 Line up the fabric for Number 3 with the edge you just cut. 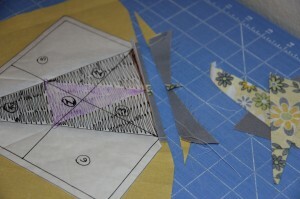 Sew the pieces together as close to the fold as possible without piercing the paper. Unfold the paper. Iron the piece open with the tip of your iron. Look! You can already see the star point taking shape. 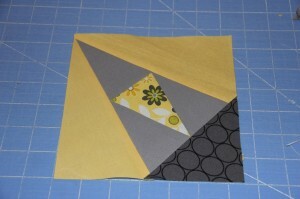 Continue paper piecing the rest of the block in number order. 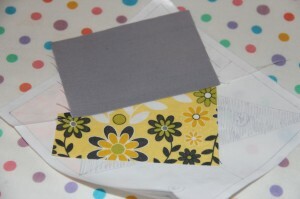 Fold back the paper between Number 1 and Number 4, trim, sew close to the fold. 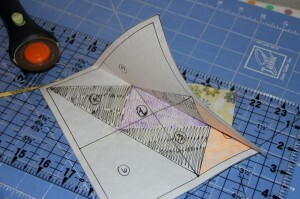 Fold back the paper along the line between the long edge of the isosles triangle and the background pieces (Number 5 and Number 6). Finally, create your final fold along the line between the bottom of the large isosoles triangle and the center square of the block (Number 7). 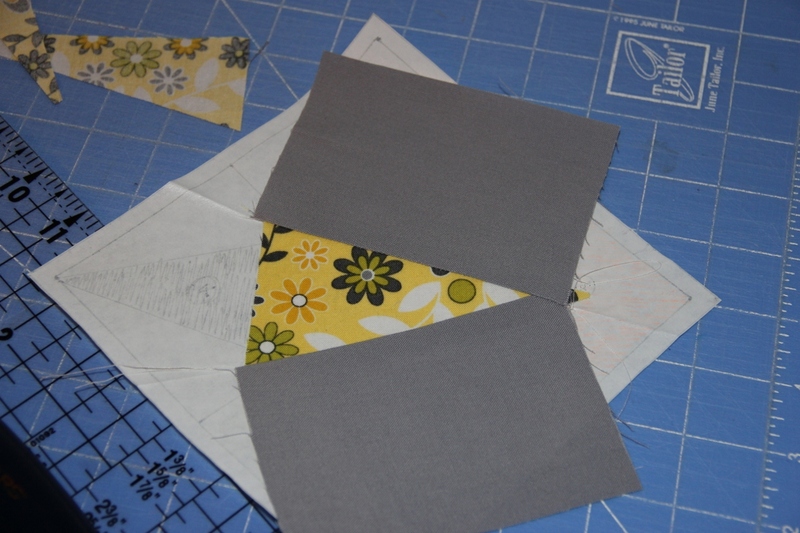 Unfold the paper and iron the entire piece. Trim to 6.5 inches. Gently peel off the freezer paper. 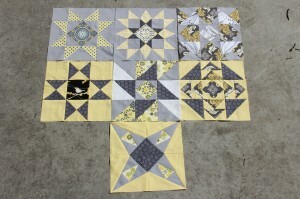 Here is one section of the block. You will need to paper piece 3 additional sections. If you used this fold-the-paper-back method, you can use the same freezer paper template. It will continue to stick to fabric with a hot iron for several more uses. Sew the four sections together. 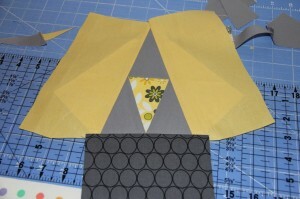 Trim the block to 12.5 inches. Hey look! Seven state blocks! How are you doing? 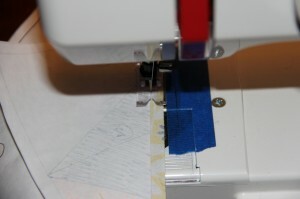 My sewing machine is in the shop for a tune up! Thought it was broken, but that seemed to fix itself overnight. However, I decided since it was already pulled out of the cabinet I would bring it in for a good oiling and tune-up anyway. I haven’t done that in the 10 years I’ve owned it – and not sure how many times it has ever happened in the 61 years of its life! 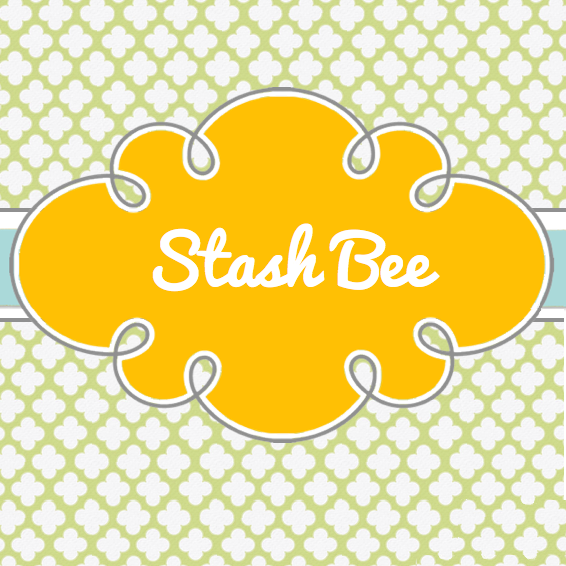 I miss it, though I’m keeping busy with a couple other projects (hopefully to share soon on the blog). 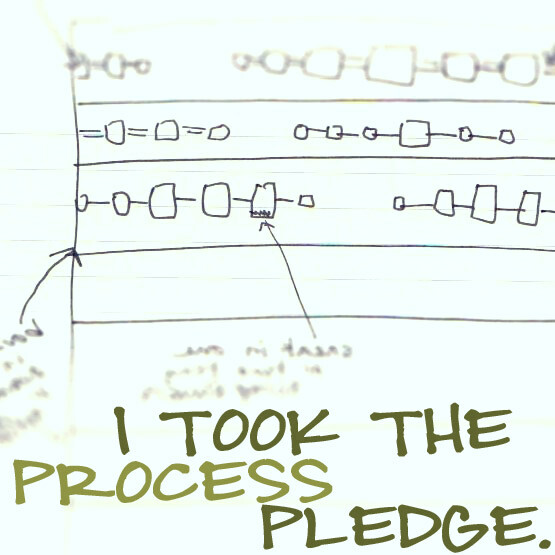 I’ll catch up with IL and IA by the end of next week… hopefully!